Oh, the places you’ll go in Travel Lite truck campers! The versatility of a truck camper is the number one reason most people chose this type. It’s an especially great choice if you enjoy fishing and four-wheeling and want to get off the beaten path. The compact size and two-axle configuration mean you can travel places that you couldn’t with a regular RV. Want to take your camper on the beach? Want to travel to some out of the way places? Want to escape the crowds? You have many more options in a truck camper than a regular RV. You can enjoy the many benefits of traveling without the restrictions of larger size RV’s. This means you have the ability to get off the main road and explore the “road less traveled.” In addition, you can save money on storage costs since many people can store their truck camper right at home. Many states still classify the truck camper as cargo rather than an RV. This means low registration fees and insurance rates. You can get better gas mileage on a truck camper than a regular RV, and they are much easier to maintain. Trucks cost considerably less to service and repair than motorhomes and there are more places available for service and repairs. Maintenance costs for a truck camper are virtually zero. Most campers are built better and need less maintenance than other RVs. This is because they don’t have wheels, axles, tires, or engines, so you have fewer things to maintain. In addition, the smaller holding tank sizes and compact designs make truck camper ownership easy! If you can drive a pickup truck, you can drive with a truck camper resting in the bed of your truck! While there may be less space in a truck camper, it offers you complete mobility and freedom. If your truck can get there, you can camp there. Priced at an affordable level, you can purchase a new Travel Lite truck camper for around $15,000 – $20,000 depending on the model and features you want. Most of our Travel Lite truck campers feature a full-size bed, CD/AM/FM, Bluetooth/USB sound system with indoor/outdoor speakers, indoor and outdoor showers, LED lights, natural wood, stainless steel appliances, and weigh in at 1200-1300 lbs. The Travel Lite truck camper is considered the king of half-ton pickup trucks. They beat every other manufacturer. The Banak wood framing is one way they build lighter campers. It weighs one-third that of pine, is three times stronger and has no knots. The flooring is 5/8 tongue and groove plywood. The plywood is more expensive, lighter, and a better quality material. Features like the aluminum-framed cabinet doors – versus solid wood cabinet doors – drive the weight down even further. It’s the overall design that makes these campers so lightweight. Travel Lite specializes in building the lightest weight truck campers and travel trailers today. Owning a truck camper is very economical, allows you to have access to sites that other RV’s don’t, it has great maneuverability, and it’s economical to operate and maintain. They are lightweight, aerodynamic, and have great fuel economy. And driving is just as easy as driving your truck! The look of the Travel Lite truck camper is sleek and contemporary. Owning a truck camper is one of the most affordable ways to become an RVer, especially if you already own a pickup truck. We love the Travel Lite truck camper, and we think you will too! Check out our current inventory and sign up to receive notices of new models arriving daily. See the Travel Lite website for information. 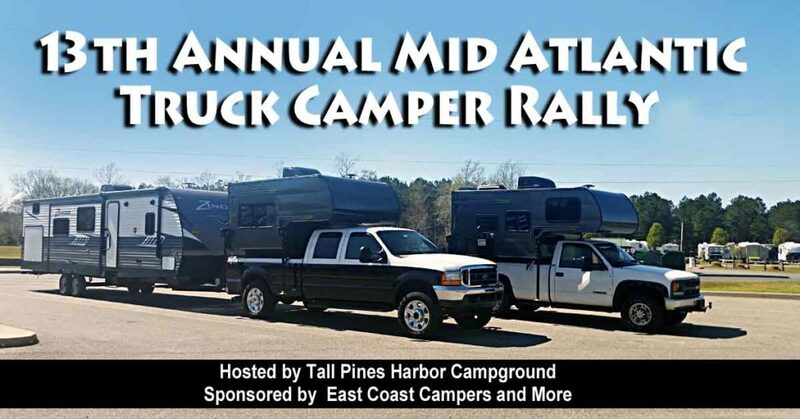 We hope to see you at the next Mid Atlantic Truck Camper Rally!